Making an ox costume is a quick, inexpensive and easy project that yields great results. Making the costume from scratch allows you to have full control over how the final product fits, looks and feels. There is no sewing required, and the costume will endure multiple washings and wearings. This ox costume is simple to make and will stand out at your next costume theme celebration. Cut out any metal from the mop head so only the stringy material remains. Dye this material brown by soaking it in the food coloring. Allow it to dry overnight. Glue the mop strings onto the baseball cap using the hot glue gun. 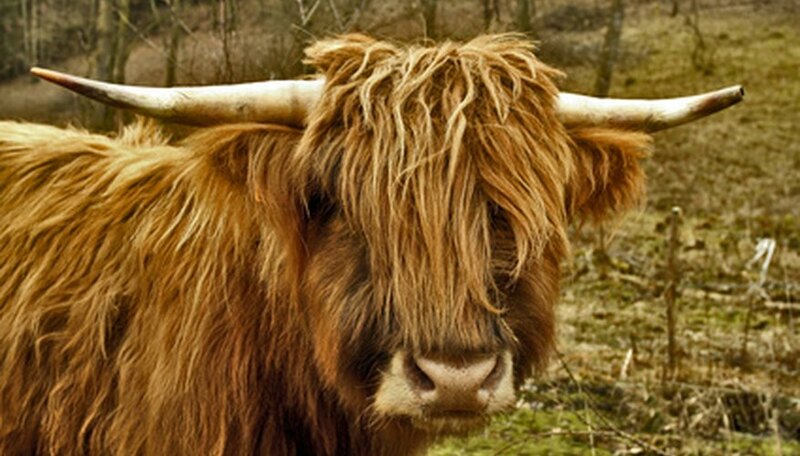 This will be the hair on the ox's head. Reserve about 10 mop strings for future use. Bunch the remaining mop strings into a group and glue them to the back of the brown sweatpants at the area where the lower back would be. This will be the tail of the ox. Cut the silver pipe cleaner in half and then fold it into a circle. This will be the nose ring. Place two dabs of hot glue on the two ends of the pipe cleaner to prevent the metal ends from irritating your skin. Put on the baseball cap, long sleeve shirt, sweatpants and nose ring. If you are light skinned, apply a brown makeup powder on the exposed areas of your skin. You can enhance the costume by purchasing additional mop heads and gluing the strands to the long sleeve shirt and sweatpants. You can modify this to be a Babe The Blue Ox costume by using blue clothing and food coloring for the mop head. Be sure to add hot glue or modeling clay to the ends of the pipe cleaner to prevent cuts and scrapes inside of your nose. Do not use the costume if you notice any allergic reaction from the food coloring dye.